Especially on this Monday. I'm up extra early because we're taking Son #2 back to college today. I might need three cups of coffee. I have a 15 ,month old and a 4 month old and this is what my nightmares are made of. I know it will happen but i hear its hard. Just remember you raised a boy who is smart enough for college and a great guy! 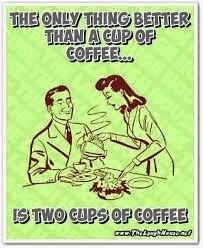 If i lived anywhere near you id bring you a coffee! Best wishes for today. Thanks, Lindsay! He's starting his 4th year, so you'd think this would get easier, but it doesn't. And to top it off, we take Baby Girl back on Friday. I need lots of coffee. :) Enjoy those little ones!